Today I would like to break down how to set goals to a short acronym that I hope helps you become more successful. The acronym I would like to use is S M A R T (This acronym is not my original idea, but it is commonly used by instructors on this subject). 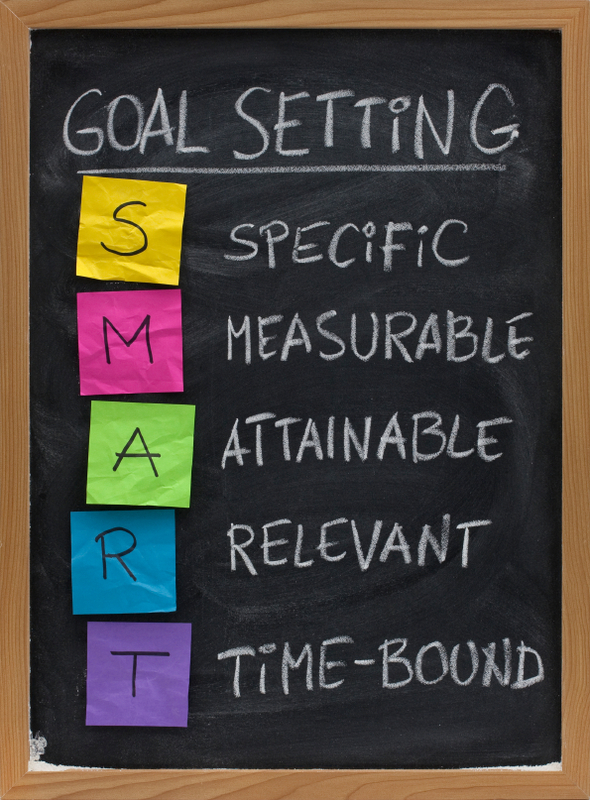 Should you decide to ‘Google’ SMART goals you will find some more very useful information. Specific – Have a specific goal. When it is specific it can be well defined and understood. A quick way to frustrate a child is to give them an instruction with no specifics. Try setting a goal and making it specific, clear and defined. Measurable – When you set a goal can you measure it? If the answer to this is ‘No’ how do you know when it is reached? Set a goal of reading one chapter an evening in a specific book, or reading for a set amount of time. Perhaps your goal is to run and exercise; then set a goal to go running for a set distance (more than to the fridge during TV commercials). Maybe you want to lose weight, set a measurable goal, not just I want to lose weight, but how much weight. This is a measurable goal. Make it meaningful and measurable. Achievable – Goals are targets which stretch you, but are achievable. For instance if you want to run and exercise regularly setting a goal of running a 3 minute mile is not achievable (professional runners do not run that fast). Maybe set it for 6 or 7 minutes, maybe quicker, maybe slower. Setting goals that are not achievable is a quick way to lose morale and an easy way to excuse yourself of any personal accountability. Accountability helps in achievement. Realistic – Goals need to be real and realistic. I constantly encourage people to dream BIG, because the God I serve loves to work in the arena of BIG. However when I consider goals in this context there should be a basis of reality found in the goal. An unrealistic goal will sap you of energy and expectancy quicker than water drains from a sink. An example of an unrealistic goal is for a 45 year old person (not naming myself here) setting a goal to be a professional hockey player, whereas a realistic goal looks more like a 45 year old person setting a goal to make a specific local community hockey team (age specific in my situation). Time – Some goals can be short term, and some are definitely long term, but they all involve an element of time or completion. Setting goals but not having a time limit or expected completion is not wise. You may not know a time limit for you goal, but you know a completion picture (such as I want to lose 10 lbs is a completion picture); or you might not know the completion picture but you have a time limit. Set a goal for a specific time or completion, that will motivate you towards the finishing point. While all of us may have different goals, dreams and desires when you break a goal down it can be manageable and achievable. Set lofty goals, set large goals, set BIG goals, then assess the goals and break them down to Specific, Measurable, Achievable, Realistic and Time goals. As you do this you will find more successful completion of goals that you used to think were unrealistic and unachievable.